Thomas Gainsborough (1727 – 1788) was an English portrait and landscape artist, the most versatile English painter of the 18th century. He was the most inventive and original, always prepared to experiment with new ideas and techniques. Gainsborough alone among the great portrait painters of the era also devoted serious attention to landscapes. Unlike Reynolds, he was no great believer in an academic tradition and laughed at the fashion for history painting; an instinctive painter, he delighted in the poetry of paint. 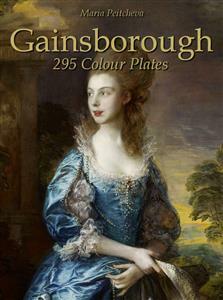 In his racy letters Gainsborough shows a warm-hearted and generous character and an independent mind. His comments on his own work and methods, as well as on some of the old masters, are very revealing and throw considerable light on contemporary views of art. Gainsborough was noted for the speed with which he applied paint, and he worked more from observations of nature than from application of formal academic rules. The poetic sensibility of his paintings caused Constable to say, "On looking at them, we find tears in our eyes and know not what brings them." His later work was characterized by a light palette and easy, economical strokes. Gainsborough was the youngest son of John Gainsborough, a maker of woolen goods. When he was 13, he persuaded his father to send him to London to study on the strength of his promise at landscape. He worked as an assistant to Hubert Gravelot, a French painter and engraver and an important figure in London art circles at the time. From him Gainsborough learned something of the French Rococo expression, which had a considerable influence on the development of his style. In 1746 in London he married Margaret Burr, the illegitimate daughter of the Duke of Beaufort. Soon afterward he returned to Suffolk and settled in Ipswich in 1752; his daughters Mary and Margaret were born in 1748 and 1752, respectively. In Ipswich Gainsborough met his first biographer, Philip Thicknesse. He early acquired some reputation as a portrait and landscape painter and made an adequate living. Gainsborough declared that his first love was landscape and began to learn the language of this art from the Dutch 17th-century landscapists, who by 1740 were becoming popular with English collectors; his first landscapes were influenced by Jan Wynants. But by 1748, when he painted Cornard Wood, Jacob van Ruisdael had become the predominant influence; although it is full of naturalistic detail, Gainsborough probably never painted directly from nature. He anticipates the realism of the great English landscapist of the next century, John Constable, but for the most part fancy held sway. In many of the early landscapes the influence of Rococo design learned from Gravelot is evident, together with a feeling for the French pastoral tradition. Although Gainsborough preferred landscape, he knew he must paint portraits for economic reasons. He painted few full-length portraits in Suffolk. Mr. William Woollaston, although an ambitious composition, is intimate and informal. To obtain a wider public, Gainsborough moved in 1759 to Bath, where his studio was soon thronged with fashionable sitters. He moved in musical and theatrical circles, and among his friends were members of the Linley family, whose portraits he painted. At Bath he also met the actor David Garrick, for whom he had a profound admiration and whom he painted on many occasions. His passion for music and the stage continued throughout his life. In spite of the demand for portraits, he continued to paint landscapes. In 1761 he sent a portrait of Earl Nugent to the Society of Artists, and in the following year the first notice of his work appeared in the London press. Throughout the 1760s he exhibited regularly in London and in 1768 was elected a foundation member of the RoyalAcademy. Characteristically he never took much part in the deliberations.